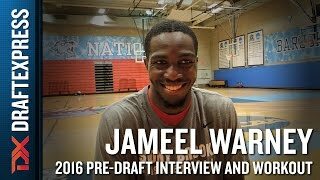 -Former Stony Brook standout Jameel Warney was the camp's heaviest player, weighing in at 270 pounds (98th percentile), 11 pounds heavier than his 2016 Portsmouth weight. Despite the gain (and the fourth-worst shuttle time at the camp), Warney actually looked fairly nimble for his size, regularly stepping out to hedge ball screens effectively. He has fairly good feet in tight spaces and was able to impact the game as an interior scorer, using either hand on jump hooks while showing strong instincts on the offensive glass. Warney did measure a tad short for a five man at 6' 7.25 in shoes, but his physical profile isn't all that different from Phoenix Suns big man Alan Williams. Warney's 7'1.75 wingspan is 0.25 inches shorter than Williams' but his 8'11 standing reach is half an inch taller. Warney doesn't have a lot of margin for error physically, so he'll have to stay in good shape, but it's not out of the question that he finds a way to sneak into the league much like Williams did. Stony Brook's Jameel Warney works out in preparation for the 2016 NBA Draft in New York City.